With its long length (11 feet) and metal stand, if taken care of properly this hammock will have a long lifespan. Hammocks are becoming more and more popular in society as individuals spend a vast majority of their day outside when the weather is nice. This Algoma Cotton Rope Hammock is a popular and durable hammock that will be beneficial to individuals and multi-occupant users. This Algoma Cotton Rope Hammock comes with a wide array of pros that will benefit the consumer(s) and just a few minor cons that you should take into consideration. The length is fitting for individuals who are tall and would like to feel comfortable while stretching out (after a good yawn of course). 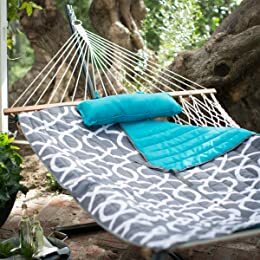 No one wants to feel as if they could fall off the hammock too easily, so the dimensions (150L x 36 W x 41.5H inches) is a great fit for pretty much, everyone. If you would like to travel with the hammock on the go, you can also purchase the Algoma 7809 Wheel Kit specifically for this hammock as well. The weight limit is 275 pounds, which can be a bit of a struggle for individuals who would like to spend time together on the hammock. Give or take the limit does recommend its specific weight limit, but you can get away with rounding it to 300 pounds. Just don’t try and push your limits too far (then you will definitely be in the wrong for any damage done). When choosing your next (or first) hammock, here are a few elements you should look into. Hammock designers have evolved over the years in their creativity and understanding what is aesthetically pleasing to the consumers. It is fun (and also serious) when deciding on a color palate that benefits your liking. As you will be spending a lot of time in the hammock, you should never fall out of love with your hammock visually. Hammocks beds and stands are made with a plethora of combinations, which will be are made from include cotton, polyester, wool, and a combination of those materials. Many consumers have their own preference that includes specific allergies or what they feel more comfortable laying on for an extended period. There are a variety of sizes that you can choose from and reasons as to why. If you know that you will be the only person using the hammock, then you can suffice with a single occupant size. However, if you would like to spend time with your companion and/or know two people will want to use the hammock at a time, it will be beneficial to purchase a double occupant size hammock. Double occupant size hammocks can actually fit more than two people. The size of a hammock can determine the occupants. However, every hammock comes with a recommended weight limit. It is important that you follow the latter accordingly not to break your hammock in any way shape or form. 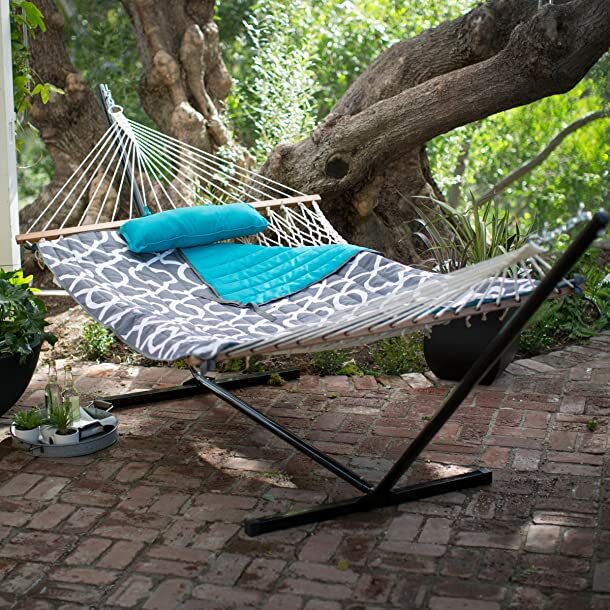 Overall, this hammock is a great choice for moderate and first-time hammock owners. The Algoma Cotton Rope Hammock is a great option for individuals and couples that would like to enjoy a beautiful day outside comfortably. With its long length (11 feet) and metal stand, if taken care of properly this hammock will have a long lifespan.